This is a smaller release than the previous one but we did want to release the fixes and improvements before the holidays so it will be available for Shmoocon next month in your favorite distro. Small issues were found in 1.5 and then in 1.5.1, which is why we ended up with 1.5.2. Respectively, a crash when running aircrack-ng without any arguments and 1.5.1 was still displaying 1.5 as the version number. Among visible fixes, the slip issue in airodump-ng when selecting an AP in interactive mode is solved, the cursor will stay on the selected BSSID when the list moves around. 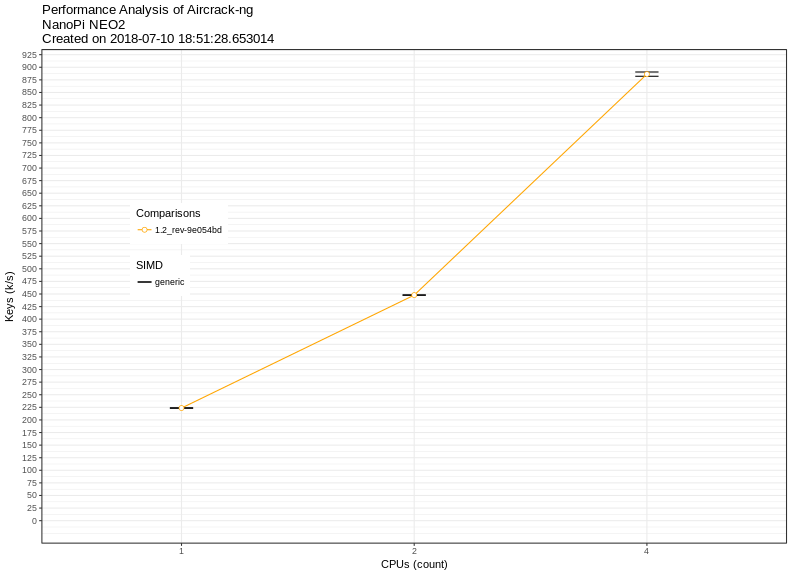 By rewriting the queues handling wordlists in aircrack-ng, some cracking issues and intermittent failures are fixed. We also have a new output file for GPS logging called logcsv. A few cosmetic issues have been fixed. There are also code quality improvements, a few new tests, improved and updated Raspberry Pis detection (nexmon), revamped GPS logging functionality in airodump-ng, fixes for Big Endian and building/cross-compiling on various OSes and last but not least, building packages for Ubuntu 18.10. As mentioned a few times in the changelog and quite a bit in the commits, we have been using a bunch of tools to improve our code quality. And fine tuning them to do more and give us better information. We also use static analysis tools but that step is often done manually. GitHub has been making it fairly easy to integrate with tools, even custom ones. Their marketplace offers a number of tools to help for development. On top of that, some companies offer to use theirs for free on open source project, which is a great way to improve code quality. Let's walk through our current CI/CD infrastructure. 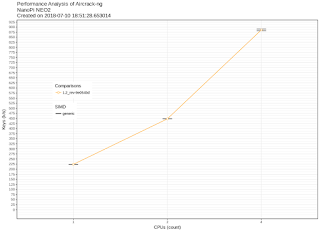 We first used Coverity Scan to do static analysis. Even though there are false positives here and there, it's a useful tool. Every single item reported by Coverity explains the path taken that leads to issue. In some cases the complexity of the path is impressive, going through more than 100 conditions. Although it can be integrated with GitHub, it works independently in our case and submitting up to two times a day if there are changes since the last time a build was submitted. Later on, we added Travis CI. It offers Ubuntu 14.04 and OSX and in both instances, we test using GCC and clang, as well as with gcrypt or openSSL. We then added AppVeyor to build on Windows. We currently build on cygwin 32 and 64 bit as well as MSYS64 and it builds a package for Windows. With the exception of the package, it tries compiling with GCC and clang in all cases. If you haven't started doing CI/CD and need to build for Windows, consider using Travis as well as it now supports it. We also added a buildbot to test with Intel C++ Compiler. They all run on the same system with the exception of armel, armhf and FreeBSD that are separate. And very recently, we added another one to build packages for a number of Linux distributions. It also automatically builds release packages when a new release is tagged in GitHub and it builds git packages whenever code is committed in our repository. We are now planning to have our own buildbot server to consolidate, simplify and make it easier to manage our buildbot infrastructure. We'll add more systems and possibly use qemu to emulate specific CPUs. An issue was reported on a Big Endian system. And, if memory serves right, we had Big Endian bugs a few times in the past. For readability, we'll refer to Big Endian as BE and Little Endian as LE. 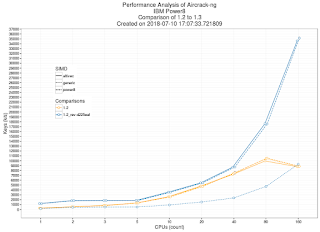 The reason we didn't catch the bug in the first place is, despite the fact that we have extensive testing on multiple OSes, using different compilers and across different CPUs, all our test systems are LE. Endianness is, basically, the way bytes are organized in memory. We started a long time ago with BE, then got LE systems. Some of them are Bi-endian and can do either BE and LE. Wikipedia has more details if you'd like to read about it. We could blindly fix the bug in our tests, but being able to test it ourselves would be better and possibly easier. That could possibly open the door to a new buildbot. 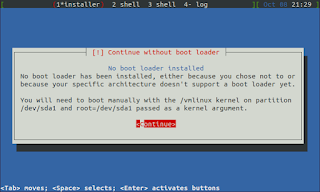 Finding a Linux (or BSD) that support it is not easy. Other option for a usable, recent Linux supporting BE is Gentoo, CLFS and possibly Arch. Embedded OS such as OpenWrt is apparently another possibility but it is limited in terms of packages. Unfortunately, Debian dropped support for PowerPC (BE) 2 years ago. FYI, if you are looking for cheap hardware for a native Big Endian system, look for a Power Mac G5 (or G4) and install FreeBSD powerpc. That's where qemu is great, as you can see in a previous post. The advantage of doing it in software versus getting physical hardware is that it we can run it along the rest of the buildbots with existing hardware and thus we avoid having to spend extra to power dedicated hardware, its maintenance and rack space. First, we need to install qemu and its utilities. We'll use the MIPS architecture in this case, on an Ubuntu 18.04 64 bit host. 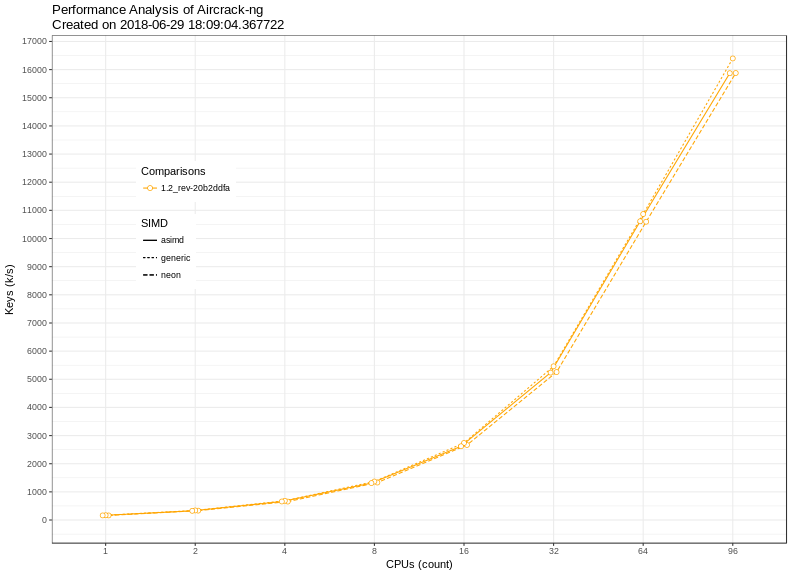 If you want to try the PPC architecture, this post is a good starting point. Now, we need to get the appropriate kernel and initrd to do a netboot. You might need to adjust the URL to download the initrd and kernel in the future. Note: the mips architecture is BE. If we wanted to do LE, we would go with mipsel or mips64el. Same goes for PowerPC, however Debian only offers PPC in LE (ppc64el). All ARM on Debian is LE. 25G is the maximum size of the disk inside the image. That size is not allocated immediately, the file will keep growing as changes are done (additions/deletion). We are allocating much more than we actually need. A base installation would be fine with 2Gb. Note: mips64 would have been preferable because it can support more RAM but Debian doesn't offer that architecture. It will start in the console. 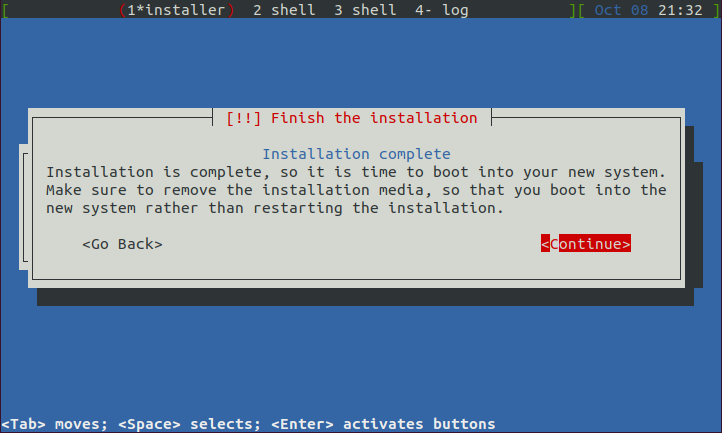 Simply follow the instructions like you would install a regular Debian system. The only two important choices that were made here, were to install all files in a single partition (and use the simple guided process when partitioning) and not install any X system due to the low memory. 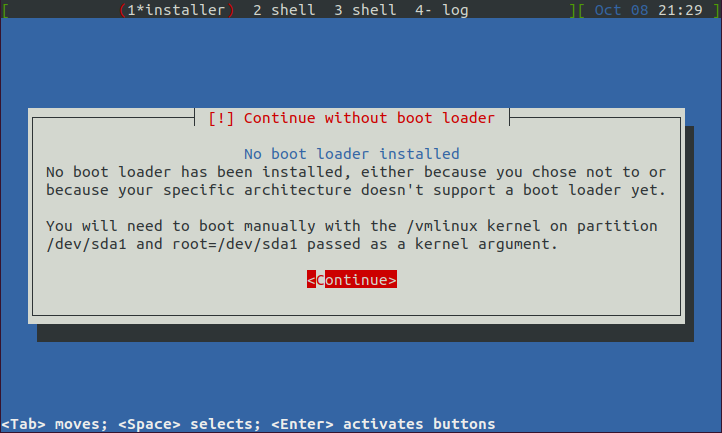 At the end of the installation, a warning windows will be displayed mentioning there is no bootloader installed. It is expected, so it's fine. A few moments later, Debian will let you know the installation is done. It will not shutdown but reboot (and restart with the netinstall if we let it). Interrupt the process by closing the terminal window (or hit Ctrl + a, c then input the command 'quit' to stop it). The initrd we downloaded earlier is for netinstall only it won't work to boot our system. We'll need to grab the one generated during the installation. For this, we'll mount the qcow2 image we just installed, disk.img. One way to mount it is to use the tools included with Qemu. We also added forwarding to access SSH on the system. Refer to the previous blog post for more details about it. Which confirms it's a BE system. There are a number of other ways to determine that. The qcow2 image will keep growing even if we remove packages or delete files. Reclaiming free space is just a matter of zero'ing the disk space left in the guest then recompressing the image on the host after powering it off. Deleting the file is very important or you may end up with an unbootable system. If that happens, just mount the qcow2 image like shown above and delete the file. After installation and updates, it took approximately 1.8Gb and recompressed, 1.6Gb, saving roughly 200Mb. Now, enjoy your new MIPS Big Endian system. 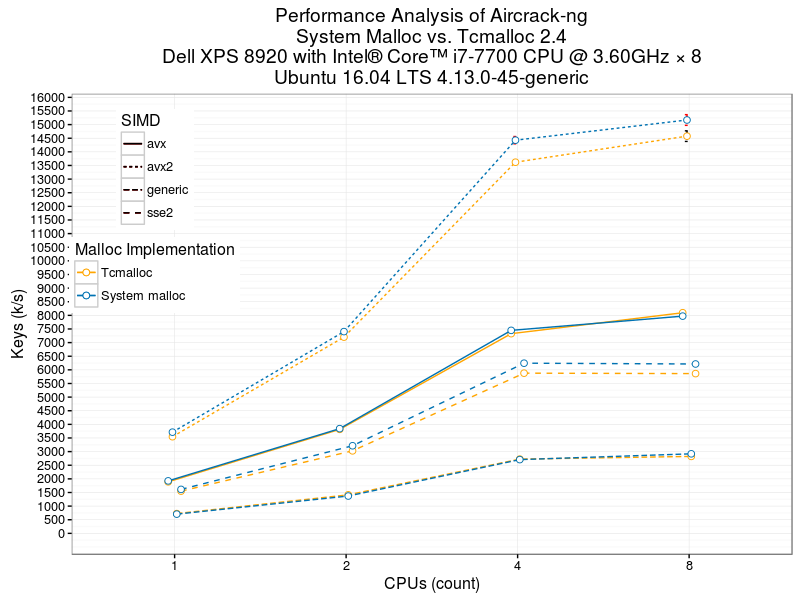 Compiling aircrack-ng inside is exactly the same procedure as you would do on a regular x86 Debian system. TL;DR: if all you want is to install the package, head over here. Packages are an easy and convenient way to install software compared to compiling it. All you have to worry about, after installing a package, is to make sure your system is up to date and there is no need to worry about each individual piece of software anymore. Today's distributions often even check automatically and notify if updates are available. 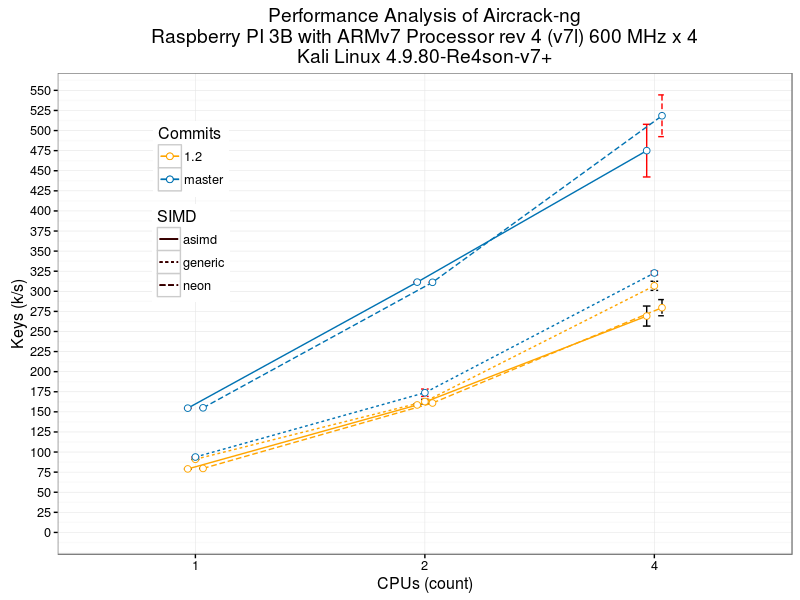 Another reason is that most Linux distributions often have old versions of Aircrack-ng in their repository and sometimes are a few years old. It can be a problem for us when providing support. We often end up telling people to uninstall and recompile the latest release or try the current development code where the bug they're experiencing is fixed. If you're a software developer, it's not too hard to figure out how to compile a piece of software, as long as the software is current and is documented. However, in some cases, it can get complicated. And if you're not a developer, it is a daunting task. We recently decided to tackle this issue and provide recent versions via packages, and for multiple OSs. Why not a snap or a flatpak? There are more than just those two possibilities as you can see in this post and all of those software are still not widely adopted yet. We may, in the future, offer snaps or flatpaks. We recently added a packages building bot to the buildbots for all the distributions mentioned on top. 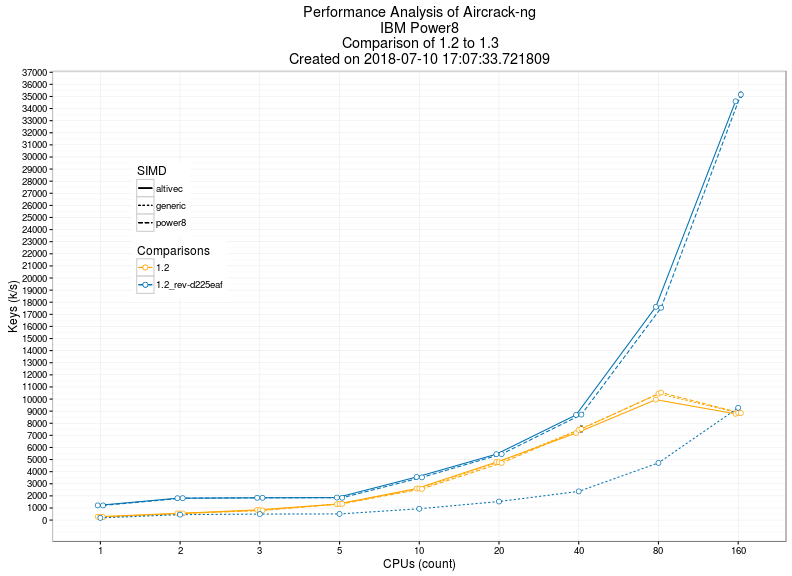 Creating packages for that many distributions is not easy and if we did it the same way package managers do, we would have to keep spending a considerable amount of time and resources. So, the decision was made that the best route was to statically compile latest version of the dependencies into Aircrack-ng. Basically, all the dependencies needed for each binary are built into each of them and what that means practically is that you can take the executable and just copy and paste it on another distro, no matter what packages are installed on that distro and how old or outdated it is, it would just work. It wasn't an easy feat. There is a drawback, the binaries are larger than if they were coming from the distribution itself (or if you were compiling them yourself with the default options), because they are dynamically linked to its dependencies, which are sometimes shared with other software. There is also a huge advantage. As mentioned above, we can support multiple OS and multiple versions of each of these OS easily and as a bonus, you will always have the latest version of the dependencies which are, most of the time, newer than what your distribution is providing. Added bonus: it sometimes fix bugs found in the library available in the distro. Maintaining repositories to distribute the packages was another issue, we could have gotten an Ubuntu PPA repository, our own repository for Debian, the different derivatives of SuSe and RedHat but maintaining repositories for different distributions is a time and resources consuming task. So, we went with PackageCloud.io to handle it. They provides instructions on how to add each of the repositories, either manually or automatically via their script. Afterward, it is just a matter of installing or updating Aircrack-ng via your package manager. 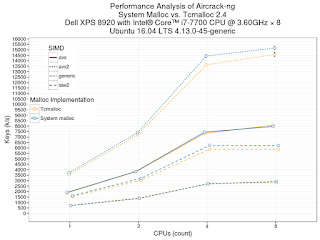 Providing packages also means our package is a drop-in replacement for the existing Aircrack-ng package available from your distro and it will still be working with any package that requires it as a dependency. Windows doesn't have any package manager we can leverage. Development binaries for Windows, built from our GitHub repository, are available on AppVeyor. On that link, select the last target, pkg, then click on the Artifacts tab. To make our life easier so we can focus on the development, it is, like all the CI/CD, automated thanks to our buildbots. The magic sauce is in packages.yaml in build/pipelines. 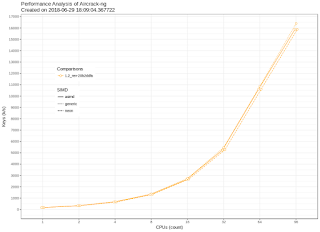 If your distribution is providing an up to date package of Aircrack-ng, we recommend to use it instead of our packages. That is, unless you are using the git packages. If you have any question about it, please head to our forum. While we didn't bring as much as in the previous release, we keep on improving continuous integration/delivery tools and our code quality keep increasing. On routers with 802.11i/p/r, the AP can cache an "ID" for the connection so roaming clients don't have to waste frames reauthenticating and just use the PMKID, which helps decrease a bit the latency (from 6 frames to only 2). A big advantage here is that this PMKID is present in the first EAPoL frame of the 4-way handshake. When selecting the network, it will use it as if it were a regular PCAP with a handshake (and thus the wordlist requirement applies). More details about the attack itself can be found in this post. 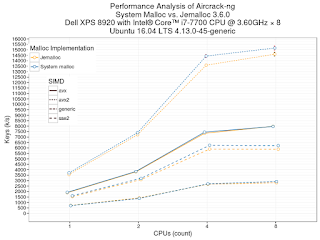 Distros often have old versions of Aircrack-ng in their repository. Sometimes a few years old. We recently decided to tackle this issue to provide recent versions, and for multiple OSs. For CI/CD, we have been using buildbots, on top of Travis CI and AppVeyor, to automatically build aircrack-ng on multiple platforms and multiple distros. It happens to every commit done to the master branch in our GitHub repository. We recently added packages building to the buildbots for a bunch of different distro: Debian, Ubuntu, Mint, SLES, OpenSuse, Fedora, RHEL, CentOS, Amazon Linux and Elementary OS. Stable release packages will be available shortly. More details will be provided in a separate blog post. 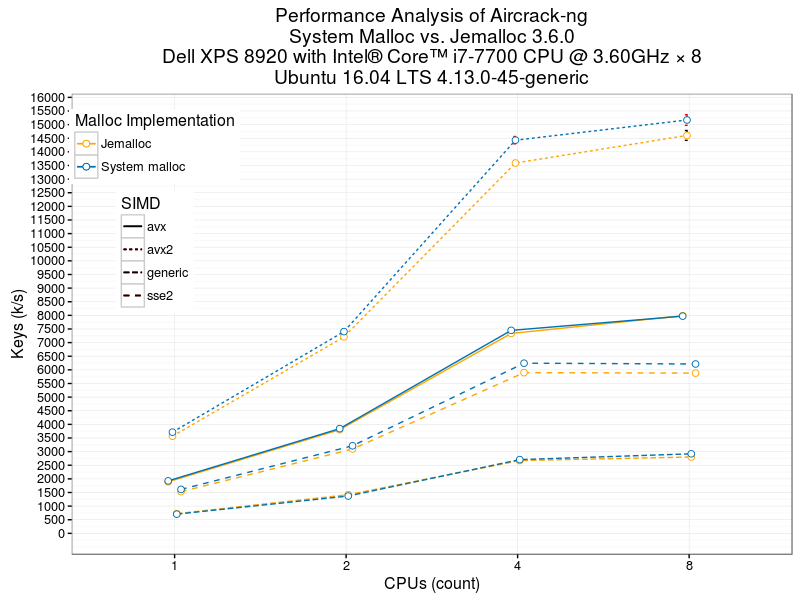 A recent bug (and PR) was opened, aircrack-ng couldn't be built with MMX using a i586 toolchain. The PR looks pretty simple and just removed some code to allow building with MMX. Building the code will obviously work. There isn't a x86 CPU these days that cannot support anything less than SSE2, which was released after MMX. So, let's take the opportunity to use qemu to emulate a MMX-only CPU so we can actually test how it runs on such CPU after building it. If you aren't familiar, qemu is known to emulate a lot of different CPUs, most of the time to play (old) games and using non-x86 CPU. It supports a wide range of x86 CPU too. Using it might sound intimidating but it's actually fairly easy. Pentium MMX, Pentium 2 (and probably Celeron of that same generation) as well as a few AMD support MMX and do not have any SSE/SSE2 instructions. Another feature in the Pentium 2 is PAE support. Celeron of the same generation typically don't support PAE. Basically, memory was addressed, like the CPU, with 32 bit, which means a limitation of 4Gb of memory. 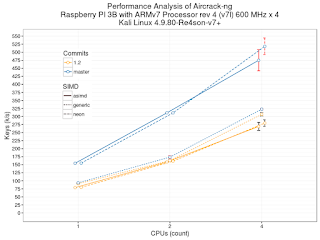 PAE extended this to 64 bit, allowing more memory on 32 bit CPUs. The OS also has to support it. The vast majority of Linux distributions these days are built with PAE even if they mention they ship in i386/i486. One exceptions: Debian. However, Debian derivative distributions don't support non-PAE systems. CentOS 6 or 7 may work too but they haven't been tested. In this example, Ubuntu 18.04 64 bit Desktop was used as a host but it should work on any other currently supported OS. We'll download the latest i386 debian ISO (XFCE or netinst) on the host. Let's go over the different options. -cpu pentium2 will use a typical Pentium 2 system. Details of that system can be found by running man qemu-system-i386. The 'enforce' parameter forces to use the instructions of that CPU only. By default, qemu will run executables on the host CPU as shown here, hence why the use of enforce, to fully emulate how a program would behave on that CPU. The second option, -cdrom debian-9.5.0-i386-xfce-CD-1.iso will mount the ISO inside the emulated system as a CDROM. This option won't be needed when the system is installed. -m 2G will give 2Gb of RAM to the emulated system. By default, QEmu allocates 128Mb of RAM, which is definitely not enough for Debian; it requires 139Mb. We just raise it to 1Gb to have some margin when we'll run the desktop. -show-cursor displays the mouse cursor. Otherwise it is invisible. And finally hda, the disk we created previously. A screen will pop up. The installation process is no different than a regular computer; it will just take much longer while because we are emulating a system. Restarting the virtual machine later on will use the same command as above minus the -cdrom option. As expected, it ended up with an Illegal instruction and it means the CPU is fully emulated in the guest (and not executed directly on the host). Anything other than the generic version will result in that error. So, since the toolchain used is i586, we need to go even further than pentium2 and use the pentium CPU in qemu (P55C). However, we have a serious issue here, there isn't a Linux distribution that supports i586 anymore, not even Debian. If you try to boot it on such platform, it will fail to boot the kernel with a CMOV instruction missing error. So, that would leaves us with Gentoo. Linux isn't the only option here and BSD supports older CPUs. For example, latest FreeBSD (11.2) still supports i486 CPUs. 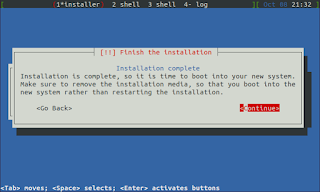 The set-up (and results) is identical to what was done for Debian earlier. Installation is straight-forward, exactly the same as you would expect on a real system. And results will be identical.